23 December 2001. St. Petersburg. Night meeting of the team. Actors are made up and dressed, necessary lighting equipment is installed. The filmmaker accompanied by his assistants checks the chosen route for the last time. Rehearsals with extras and groups of characters. At 1.15 p.m. after three unsuccessful (due to certain technical problems) attempts the shooting starts. The shooting lasts for 1 hour and 28 min. After the shooting and short break the press conference takes place at the Hermitage Theatre. The filmmaker, the Director of the Hermitage Mikhail Piotrovsky, the conductor Valery Gergiev (who has arrived from the USA for one day only in order to take part in the shooting) answer the questions of the press. Night meeting of the team. The filmmaker and assistants. 22 December 2001. St. Petersburg. Preparations for the shooting of the film Russian Ark are carried out in the Hermitage. second operator Berndt Fischer, Alexander Sokurov. 17 December 2001. St. Petersburg. 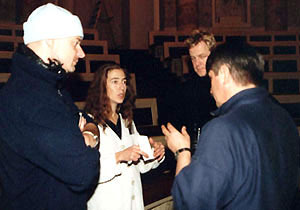 Principal rehearsal of Russian Ark shooting. Following the camera of the director of photography Tilman Buttner, the filmmaker and his assistants take the route according to the script. Thirtyfive halls and three epochs are covered within 1 hour 15 min. 12 December 2001. St. Petersburg. 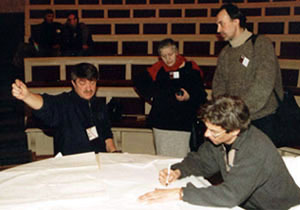 Oneday shooting of Alexander Sokurov's project Russian Ark (working title The Hermitage) is scheduled for 23 December 2001. For technical details see the Hermitage Bridge Studio website. Films nominated for the National Cinemapress and Cinema Critics Awards announced. Award winners will be known on 26 December. Best actor  Leonid Mozgovoy. 07 December 2001. Onfleur (France). In the French town of Onfleur the IXth Russian Cinema Festival has finished. Alexander Sokurov's Taurus has been awarded the Special Prize of the Jury. 30 November 2001. Belgrade (Jugoslavia). The movie TAURUS receives the main prize of the 8th Author's Cinema Festival A Look into the World (Pogled u svet): the Alexander SashaPetrovich prize as Best movie. 30 November 2001. Minsk (Belarussia). TAURUS is presented in the main (competition) program of the 8th International CIS and Baltic Countries Festival. Leonid Mozgovoy has been awarded the Cinemapress Jury prize as Best actor for playing the Leader. 28 November 2001. Belgrade (Jugoslavia). The movie Taurus is presented in the main (competition) program of the 8th Author's Cinema Festival A Look into the World (during the festival the movie is shown 5 times). 23 November 2001. Belgrade (Jugoslavia). The movie Taurus participates in the main (competition) program of the 8th Author's Cinema Festival A Look into the World (Pogled u svet). Jury of the 8th Author's Cinema Festival A Look into the World. 07 November 2001. London (Great Britain). Sokurov's film Elegy of a Voyage is announced among the nominees for the European Film Academy annual prizes and is a candidate for the European prize as the best 2001 documentary established by Arte channel (European Documentary Award 2001  Prix Arte). Winners in the nomination European Documentary Award 2001 are to be announced on 1 December, Saturday, during the galaceremony due to take place in Tempodrom hall, Berlin (Germany). 30 September 2001. Kiev (Ukraine). The Ukrainian premiere of TAURUS in the great hall (seating capacity 1,950) of Kinopalats movie theatre. At 6 p.m. Alexander Sokurov's press conference. The premier of ELEGY OF A VOYAGE on the FrancoGerman TV channel Arte. 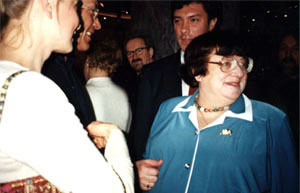 29 September 2001. Kiev (Ukraine). The retrospective of Alexander Sokurov's feature films launched in the Ukrainian capital. 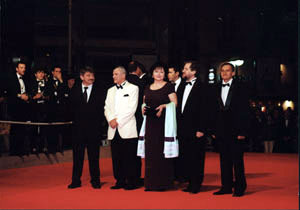 Ten feature films by Sokurov were presented within one month. 04 September 2001. Venice (Italy). The world premier of ELEGY OF A VOYAGE in The New Territory program of the 58th Venice Film Festival. 01 August 2001. St. Petersburg. Production of Alexander Sokurov's new video ELEGY OF A VOYAGE completed. 01 July 2001. St. Petersburg. Lenfilmvideo released videotapes with Sokurov's films TAURUS (video version), MOTHER AND SON, THE DIALOGUES WITH SOLZHENITSYN, THE JAPANESE STORIES, which, alongside the earlier released by the same company MOLOCH, formed the director's video anthology. 14 June 2001. St. Petersburg. 14 June  Alexander Sokurov's 50th Birthday. 12 June 2001. St. Petersburg. Work on the documentary and feature project THE HERMITAGE (WATERLOO) in progress: auditions, development of the director's script, organization period. The supposed date of the one–day shooting  29 December 2001. 07 June 2001. St. Petersburg. Work on the feature film project FATHER AND SON (GermanRussian coproduction) in progress. Script development, auditions. Shooting period is supposed to start in April 2002. 01 June 2001. St. Petersburg. Preparations for the feature project HIROHITO (JapaneseRussian coproduction). Shooting period is scheduled for 2003. 17 May 2001. Cannes (France). TAURUS is presented in the main program of the 54th International Film Festival in Cannes. Prior to the screening of TAURUS in Cannes. The Moscow premiere of TAURUS in Rolan movie theatre. At the premiere of TAURUS in Rolan movie theatre. 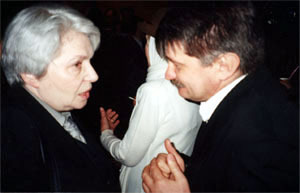 Natalia Solzhenitsyna and Alexander Sokurov. 24 February 2001. St. Petersburg. 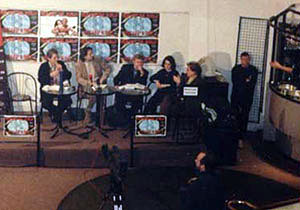 The premiere of TAURUS at St. Petersburg Filmmakers' Union.